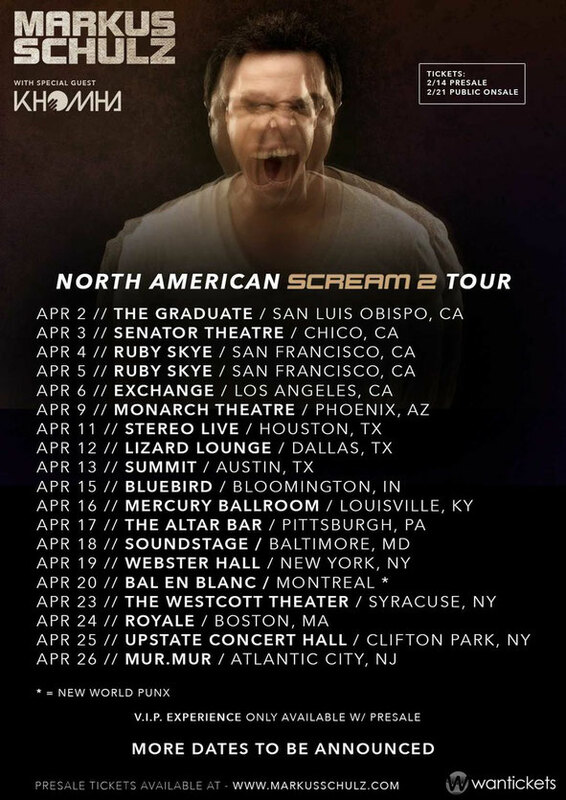 Markus Schulz recently announced that he’s taking his forthcoming artist album, ‘Scream 2’, on the road for an 18-wheel trek across the USA and Canada throughout April. Recently, in Los Angeles, Markus sold out the Sound Club months in advance and played before an intimate crowd who were hungry for the big room sound in close quarters. In Miami, Markus rewarded his hometown fans at Mansion with a lengthy set that spanned his own back catalogue, new productions and personal favorites. And in New York’s Pacha, where Markus played from 10PM until 8.30AM, he played over 125 tracks that weaved through trance, deep house, techno and nearly everything in between. These three record release parties were great successes and now Markus is bringing his style of DJing to fans across the USA and Canada. The ‘Scream 2’ bus tour kicks off with a string of dates in California before heading to Texas, the Midwest and Montreal before winding its way down the east coast. The tour will also feature state of the art production that should make this a great dance music event.